Wood Man's stage is a forest inhabited by robots that resemble wildlife, such as robot bats called Battons, mechanical hares caled Robbits, and atomic chickens called Cooks. The Metal Blade is a useful weapon against almost all enemies, especially the bats which hang overhead and attack by flying down to collide with Mega Man. Also, it can be used to fire downward to destroy the mechanical apes called Monking before they jump onto the same platform as Mega Man. A: As you start running along to the right, the black orbs hanging from the tree will reveal themselves to be bat robots known as Battons. Once they begin flying, they track down Mega Man's location in an effort to bite him before flying back up to the safety of the trees. Along the way, you will encounter three Robbits, rabbit robots who mostly remain stationary and fire carrot missiles in Mega Man's direction. Shoot them down as quickly as possible and move on. B: This is the start of a three screen sequence against giant blue wolf robots known as Frienders. Frienders remain entirely motionless throughout their appearance, but they attack by breathing a powerful fire breath weapon which initially moves downward before arcing back up to the top of the screen. Think of fighting Frienders like a game of jump-rope: they fire their flames with predictable timing, so you can leap into the air to avoid the attack while you fire your weapon back at the Friender. Repeat this pattern and remain patient, and you will be able to remove them and advance. After defeating the third Friender, climb up the ladder to the next section. C: You must leap across a set of suspended platforms. As you do, you will be attacked by two types of enemies: Monkings and Pipis. The Monkings will appear from below, latching on to a platform for a moment before pulling themselves up to the platform to attack. Meanwhile, the Pipi birds will fly on to the screen clutching an egg. They drop the egg and crack it on the platforms below, causing several Pipi hatchlings to appear. Make the Monkings your priority, but clear away any Pipis when you have the chance. D: You must climb down three screens, each of which are occupied by a single Robbit. You face the first one on level ground, but the next two appear below you. If you have the Bubble Lead weapon, you can use it and watch the bubbles drop down to the Robbits. You can also try shooting Metal Blades diagonally at them. Otherwise, you'll have to attack them face-to-face. E: The final challenge that you face before reaching Wood Man's lair is a set of Cooks, robots which resemble chickens that run from right to left. Cooks are extremely difficult to defeat, but the good news is that you don't really have to fight them. If you hold still as soon as you see them, they will leap over your head and continue on their way, allowing you to continue on yours unharmed. Wood Man's weapon is the indestructible Leaf Sheild. Upon activating it, four leaves begin to circle around him, while four more leaves launch up to the ceiling. 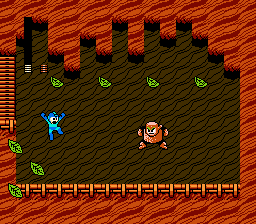 Around the time that the second four leaves begin to float down to the ground, Wood Man will hurl the spinning leaves at Mega Man. The circle of leaves are nearly as tall as Mega Man can jump, so leaping over the leaves safely requires impeccable timing. Even after you do so, you must still avoid the falling leaves by standing in the gaps between them. With each attack, Wood Man leaps in Mega Man's direction. Your only opportunity to attack Wood Man is when his shield is down. You have precious few moments to attack him, so you need to make them count. Defeating Wood Man awards the Leaf Shield, which surrounds Mega Man with impenetrable leaves as long as he stands still. This shield becomes a projectile when Mega Man moves, flying off in the direction pressed on the D-Pad, including vertically. Due to the limited opportunities to attack, you need to use a weapon that can do the most damage possible. And you are typically forced to wait a while before you can attack. It turns out that a shot from a fully powered Atomic Fire will deal tremendous damage to Wood Man. You can begin charging it up while waiting for Wood Man to launch his shield at you. Even if you get hit, keep the attack button held down, and release it when you have a clear shot at Wood Man. In Normal difficulty, it just takes one shot to defeat him. On Difficult (or in Rockman 2) you must do this twice. If you don't have Atomic Fire, the Air Shooter is an alternative that you can use against Wood Man. You must shoot him at very close range to keep the tornadoes from floating up to the ceiling. However, at point blank range, the Air Shooter is in fact capable of penetrating Wood Man's shield and striking him. This page was last edited on 27 December 2015, at 04:39.